I create icons, interface themes and other artwork for desktop software and touchscreen applications. I also design user interfaces themselves and plan user interaction. I can offer thoughtful usability review of your software and highlight areas for improvement. GSD-Sonet is a Flash-based system for remote-controlling a building’s infrastructure: heating, power, security systems and so on. 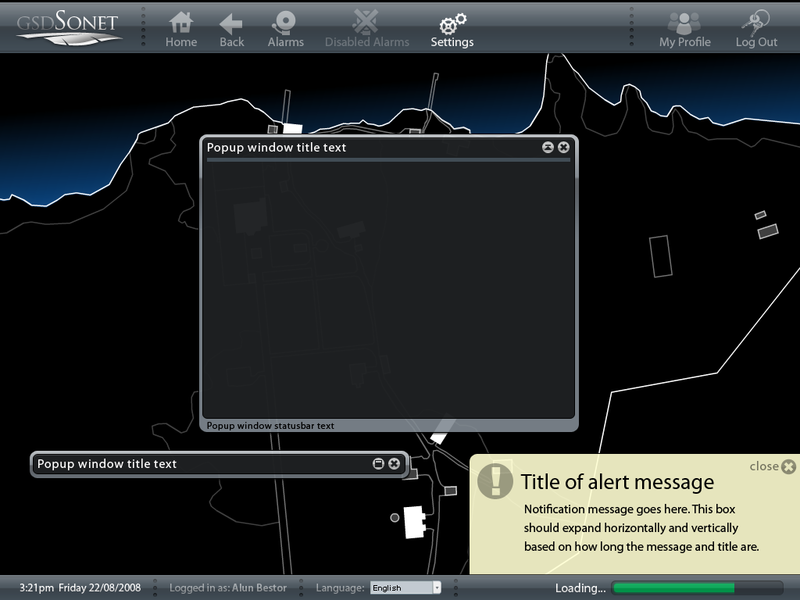 The interface is designed to run in a kiosk-style fullscreen browser window. To reduce eyestrain and power consumption it has been trained to look good in black. These scalable vector illustrations were designed for use both as icons and in printed documentation. Because I lack 3D modelling skills, each was created (rather laboriously) by hand. A set of full-color cursors made for Windows 2000/XP in 2002. I copied the OS X bubble motif that was in vogue at the time. You can download the cursor set, if you like. These toolbar icons were commissioned in 2001 for RVM Station Manager. This style of icon design is now terribly unfashionable of course, but I still have a place in my heart for pixel-painting.